We are honored to have won Best of Amarillo for 9 years in a row. 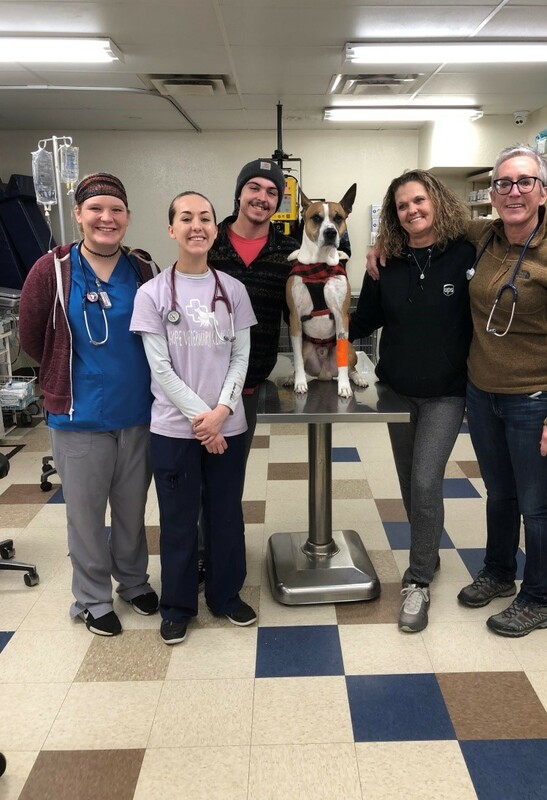 Hope Veterinary Clinic, PA focuses on small animal medicine and surgery. We are committed to helping our clients select the best medical decisions for their pets. We believe education and communication are very important in companion animal care. Our staff is a cohesive group of individuals who work very hard to ensure that your pet is safe and comfortable while in our hospital. We are focused on the cleanliness of all areas of our clinic. Dr. Faulkner has over 35 years of medical experience and a passion that is essential when facing the challenges of small animal medicine and surgery. Let us know how we can help you. A companion animal can make a great difference in your life and we are here to help whenever you need us. 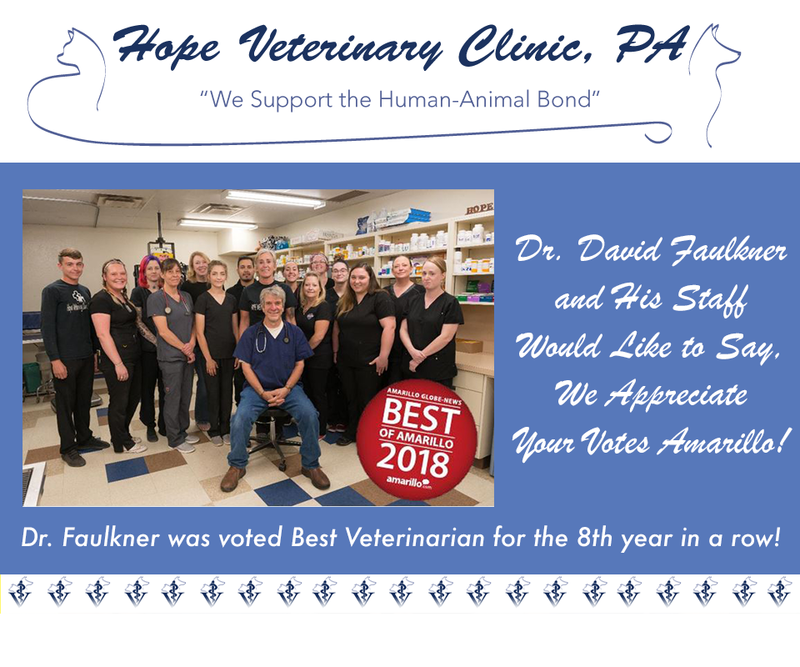 Hope Veterinary was founded in 1981 by Dr. David Faulkner and our mission statement is "We support the human-animal bond". Click to learn more! Keeping your pets happy and healthy is our job, and our site is full of helpful info, including nutrition, vaccinations, medication, and geriatric pet care. Need to make an appointment for your pet with one of our Amarillo, TX vets, or have a question? Call us today at 806-353-5566 or fill out our Contact Form. tragedy and the proposed Ordinance. I will assume here that all reading this will know to which Ordinance I am referring. I am Sarah Faulkner and I am writing on behalf of the business, David and myself. 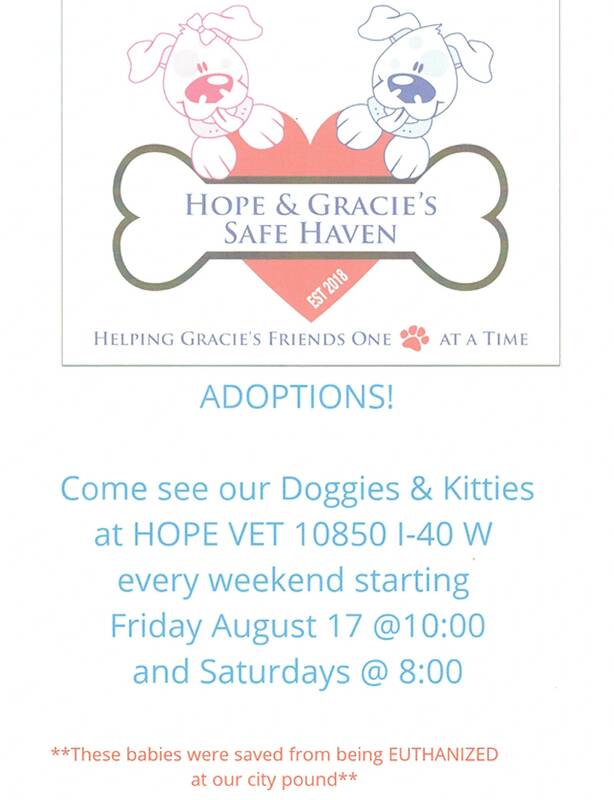 We have long been supporters of the Amarillo Humane Society and the many shelters and rescue organizations in the area which ultimately pull animals from the City Pound and find them suitable homes. I have been impressed with the work done through many people and at times, have seen unity and reciprocity between the Pound and the rescues. The G7 debacle and the proposed Ordinance have put all at an impasse but we have to use this current climate to answer some tough questions and make some changes. at the most vital and yet most vulnerable time in a female's life. An act like this would never, ever occur inside the walls of a veterinary clinic. We do not support the proposed Ordinance. It smacks of a discrimination lawsuit and is entirely unenforceable. pertaining to licensed litters if our City does lose its mind and adopt the proposal. I answer this question. We have kept those fees low as we can to help as many as we can schedule and sterilize. We honor as many certificates as we can. I do not believe that a LCSNC will harm veterinary clinics. There are enough people who simply want their veterinarian to perform the surgery and will go to that clinic. We are scheduled two months out! The people who want to spay and neuter but are on a tight budget will use the LCSNC and bounce back to the vet clinic for other types of care. to know that if anyone wants to hear my story of what he is capable of doing when he is crossed, please call me. I hope you are the news. I'm standing right here. 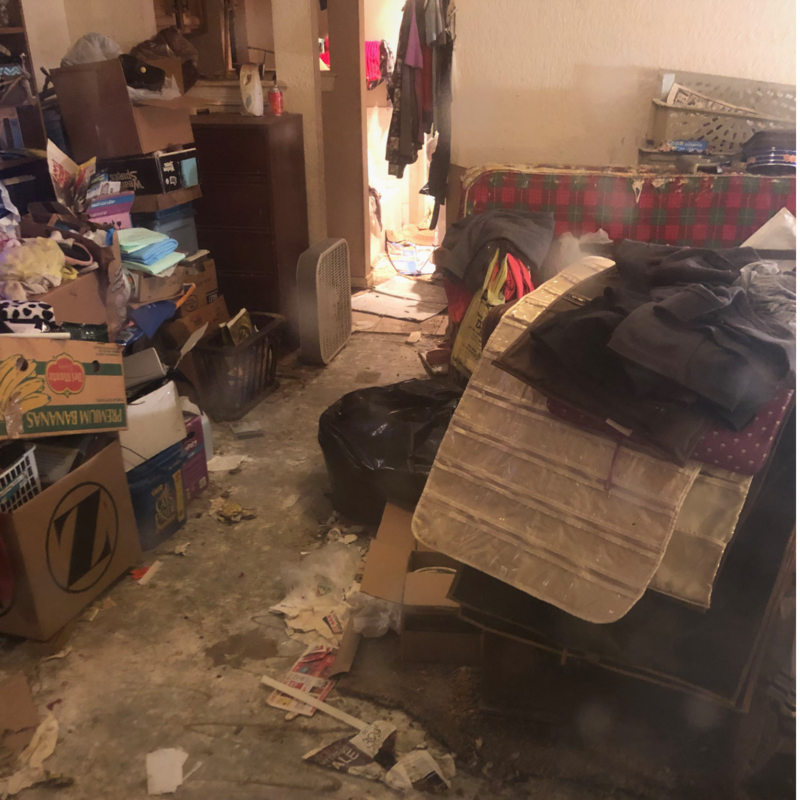 Last week Hope Vet Clinic was involved in rescuing 35 adult cats and 19 kittens from the most devastatingly filthy environment I've ever seen involving animal cruelty. 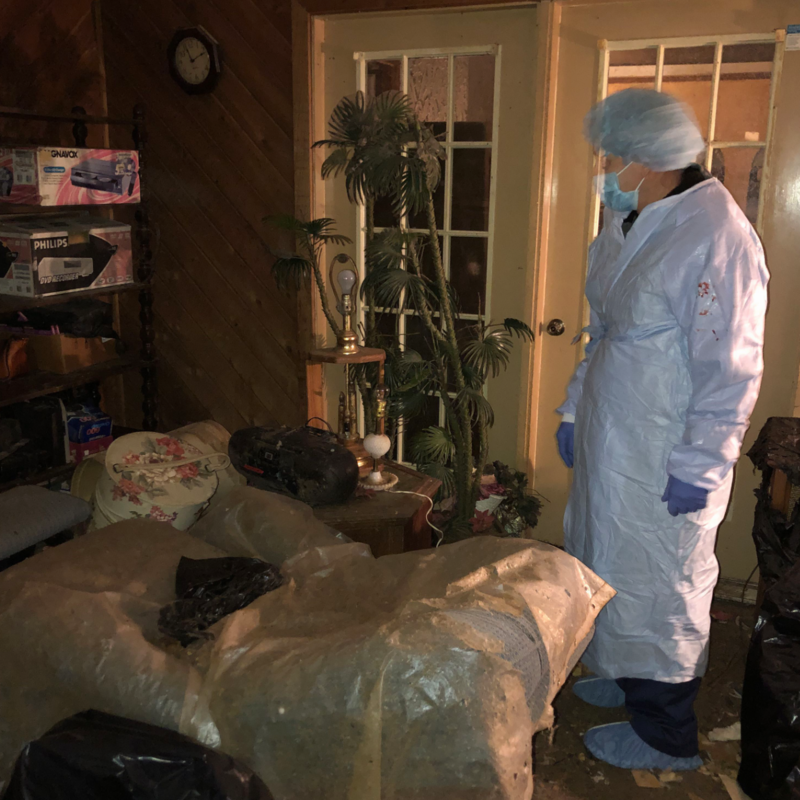 From our staff, I would like to thank Kristian Tucker, Cherelle Rubins, Brea Brown and Michael James as well as William Kearn, a friend to all animals for helping rescue these animals from certain death. Anyone who could foster or adopt these cats and kittens will be greatly appreciated. Due to the volume of animals, I cannot promise, but I will try to get corporate sponsorship for vaccinations. Feel free to come by and any staff member can show you the cats that are available. Obviously, we do not want to divulge the location of where these animals were hoarded. The property manager said the building will be taken down to the frame to be rebuilt. The person responsible is an aged woman who used to be a conscientious care provider but somehow lost her way. 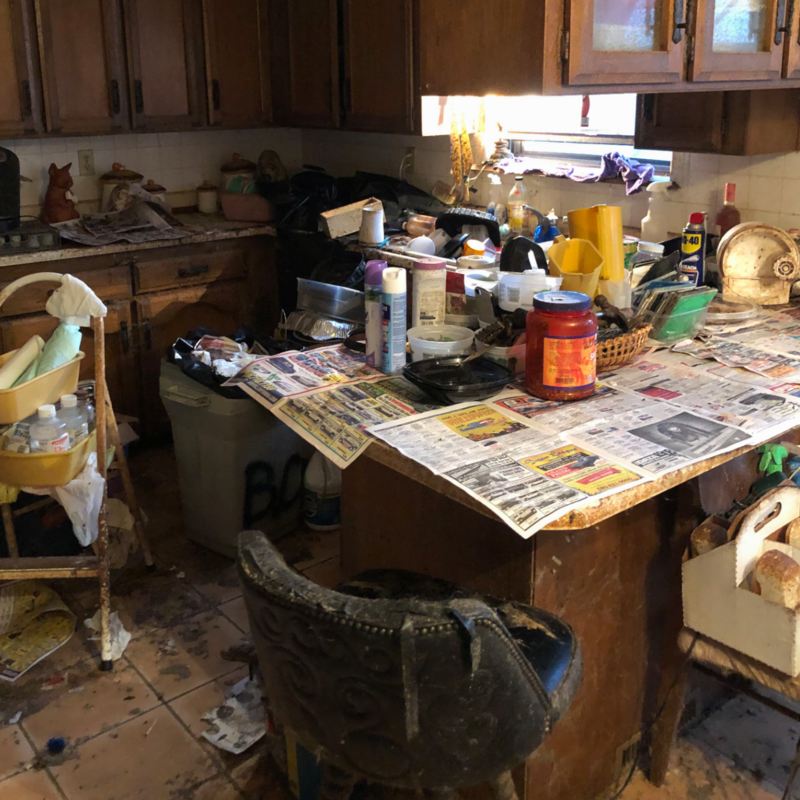 It is not our intention to drag this woman's name through the mud but that said we have many more pictures on hand if anyone would like to see more of the environment in which these pets suffered. Some were born in this disaster and have never had a breath of fresh air in their lives. Most are friendly and have adjusted to the new norm quite well. Many are this side of wild. Several would be great for barn and shop cats! All must be sterilized but will have to be worked into our busy surgery schedule. You may have your own veterinarian for the procedure. We will honor any sterilization voucher as we cannot sterilize the cats at no cost; there are simply too many. Any fourth-year veterinary student could sterilize at the clinic on a Saturday under Dr. Faulkner's license and mentorship as long as the client has a voucher! Our case of the month presents another successful treatment of a B- cell lymphoma in a canine patient. Meet Romeo and April Spruill! April brought Romeo to the clinic acutely ill with swollen peripheral lymph nodes. At the time, he was five years old and in excellent condition. What a patient! Romeo is sweet, calm and cooperative and what I can best say about April, besides the fact that she brought Romeo to all 26 appointments, is that she makes incredible cheesecake. We are posting another lymphoma case because we want to reinforce the fact that chemotherapy in pets is an attainable, manageable, and tolerable means to manage a devastating illness. The pearl in this case is that during his treatment we were able to lower the doses and still maintain remission of the lymphoma patient. After discussing his case with a boarded oncologist, we learned to reduce doses and not endanger success. This is one more thing we know as we advance our knowledge of practicing oncology in a normal clinic setting. Romeo remains in complete remission. He is in his third full month! Thank you for teaching us Romeo, you and your best person, April, were wonderful throughout the case.